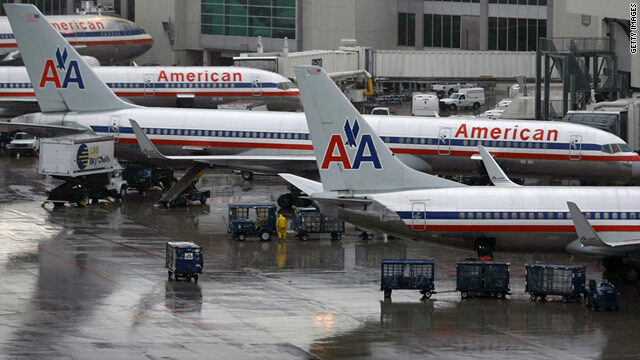 American Airlines' move to distribute its own fare information has sparked controversy. (CNN) -- A company that provides airfare information to travel agents announced plans to end its relationship with American Airlines Wednesday, the latest move in a heated dispute between the airline and companies that distribute fares. Sabre Holdings Corp. will stop offering American Airlines fares on its global distribution system in August, a month before the airline's contract is set to expire, according to Chris Kroeger, Sabre's senior vice president of marketing. The company has also lowered American's position in the system's schedule and fare displays and revoked discounts on fees the airline pays to Sabre for each booking. American Airlines has been pushing to provide customized fare information through its own system, cutting out distribution intermediaries. "Sabre is taking actions to protect its interests and those of its customers by supporting airlines who value the transparency and efficiency of the proven system we provide," Sabre said in a statement. The airline fired back Wednesday afternoon. "Sabre's actions are discriminatory and patently inconsistent with both its contractual obligations and its professed goal of ensuring full transparency for the benefit of consumers and travel agents," the airline said in a statement. "In contrast, the actions only serve to protect Sabre's market position and attempt to force airlines and travel agencies to rely exclusively on its legacy systems that only lead to higher fares and fewer choices for consumers." Sabre, one of several airfare global distribution systems, says American's plan will make it harder for consumers to comparison shop. When the airline and online travel site Expedia couldn't reach a distribution agreement, Expedia removed American Airlines fares and schedules from the site on January 1. American stopped offering its tickets on Orbitz.com in December. The American Society of Travel agents expressed concern Wednesday about American's distribution system. "Travel distribution is not a spectator sport, and no one will be spared if an appropriate resolution is not reached that recognizes the burden that this so-called innovation in distribution will produce," the organization said in a statement responding to Sabre's actions. ASTA called the airline's technological change "a solution looking for a problem to solve," and urged other airlines to "think very carefully before going down a similar path." American said the move to direct distribution would benefit travel agents and consumers. "Our direct connection will help travel agencies help their own customers by giving them access to customized choices and delivering the best value to travelers," said Derek DeCross, American's vice president and general sales manager in a December 29 statement. Customers looking to compare flights online can visit other travel sites such as kayak.com, priceline.com or travel agencies, American Airlines said, as well as the carrier's own website, aa.com.